I cleverly replaced one stick of butter (that’s right: one whole stick) with 3/4 cup sunflower oil. 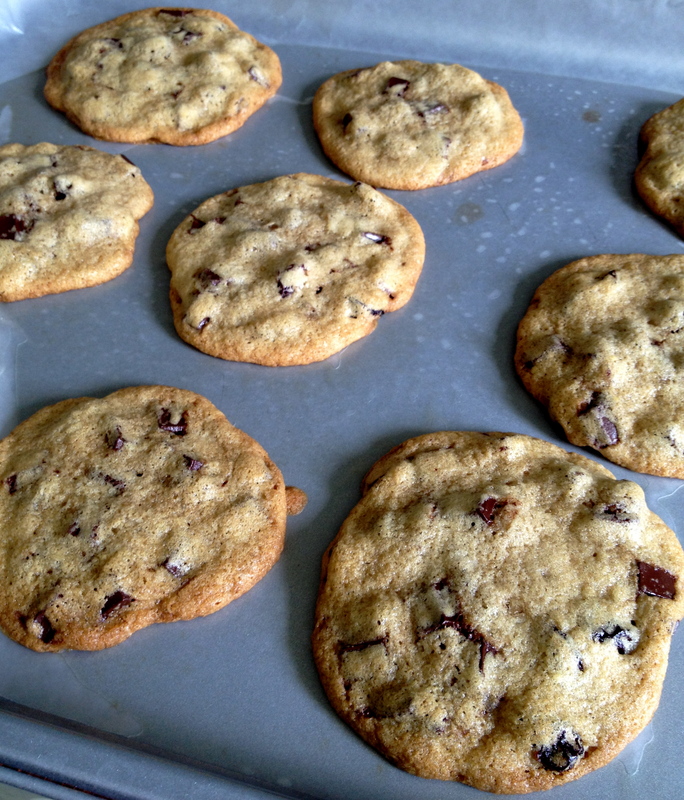 The cookies came out crisp, moist, and ironically, buttery. Using more light brown sugar than regular sugar also eliminates calories. I used equal parts organic fair trade sugar and regular granulated sugar, simply because that is what my pantry had on hand. Feel free to use 1/2 cup organic fair trade sugar or 1/2 cup granulate sugar, although I find that the organic sugar offers a less obviously sweet flavor to my baked goods. 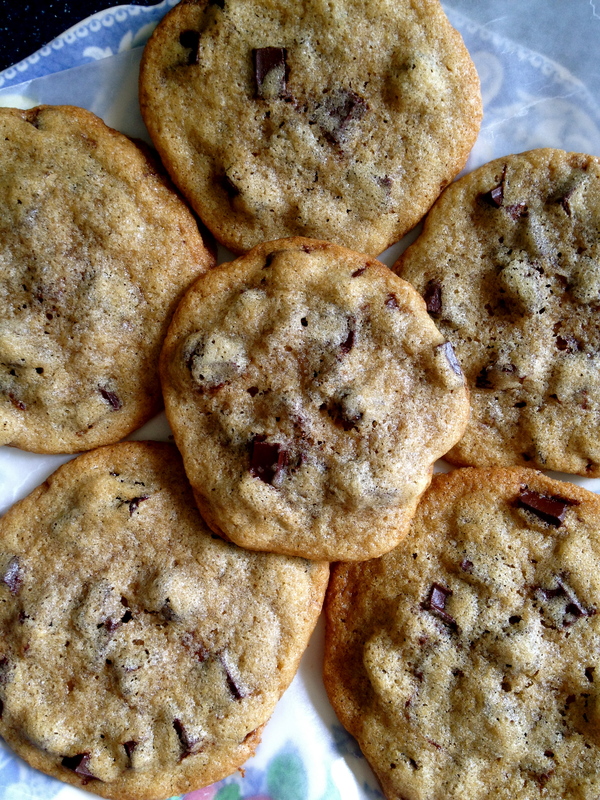 Ingredients: 2 1/4 cup all purpose flour, 2 1/4 cup dark chocolate chunks, 1 stick butter at room temperature, 3/4 cup sunflower oil (or other vegetable oil), 2/3 cup organic light brown sugar, 1/4 cup granulated sugar, 1/4 cup organic sugar, 2 tsp pure vanilla extract, 2 eggs (cracked into a bowl before adding to mixture), 2 tsp baking soda, 1 1/4 cup dried cherries, pinch of salt. Preheat the oven to 350 degrees. Line two baking sheets with parchment paper. In the bowl of a standing mixer fitted with the paddle, combine the butter, oil, sugars, salt, and vanilla on medium. Add the eggs, mixing until combined. In a medium bowl, mix the flour and baking soda together. With the electric mixer on low, slowly incorporate the flour mixture until just combined. Do not over-mix the batter. 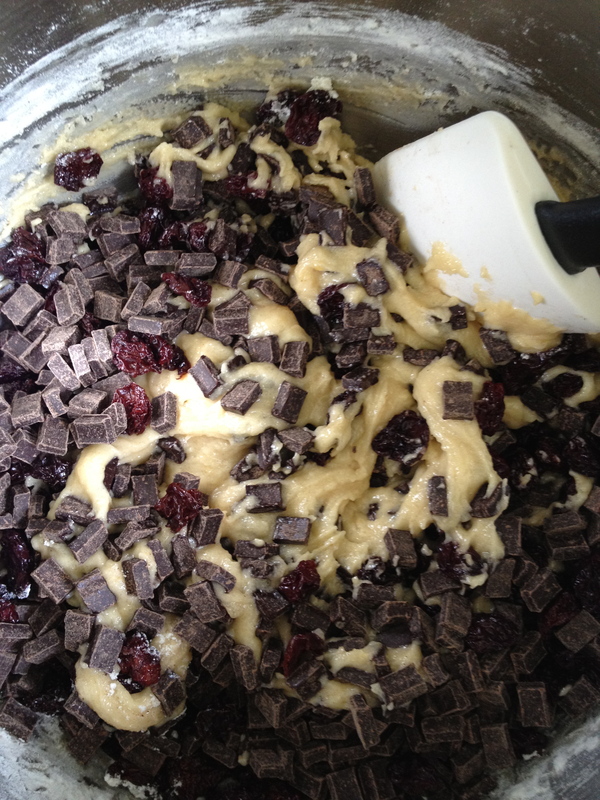 Add the dried cherries and chocolate chunks and mix for about 10 seconds. Refrigerate the batter for anywhere between one hour and one day. Scoop tablespoonfuls of the dough onto the prepared baking sheets about 1.5 inches apart. Bake until golden, about 9 minutes. Allow the cookies to cool before transferring to a baking rack.